What comes to mind when you think of Human Resources? There are many misconceptions that surround what an HR Professional actually does. As an HR Consulting firm, we have heard it all. One of the most prominent misconceptions is that a Human Resources Professional’s main objective is to recruit talent. Although this is an important aspect of Human Resources, it is neither the sole nor the most central task of an HR Professional. Human Resources is the department in an organization that manages all employees and ensures engagement and productivity is maximized, as well as make sure the company is protected from any issues that may arise from the workforce. Here are the key components of a typical Human Resources professional’s responsibilities. In recent years, there has been a shift whereby HR is seen by more organizations than ever before, as a strategic business partner. Employers are slowly realizing the crucial role in which HR plays in developing a company’s strategy, as well as handling the employee-centered activities of an organization. The value HR provides as a strategic business partner cannot be overlooked. The implementation of your strategic plans cannot be successful without employee involvement and input from human resources. Realizing the value of HR management is instrumental to developing a successful business strategy. HR’s forward-thinking principles and business acumen will ensure your strategic plans are implemented effectively. One way to stay competitive in any industry is through compensation and benefits. HR Professionals work to design compensation and benefits programs that attract top talent. This process involves the management of employee expense budget, setting the performance standards, setting compensation policies and introducing competitive benefits for employees. For example, if the industry that your business is currently operating in attracts talent of seasoned candidates that have families and are looking for stability, your compensation program may rely heavily on well-rounded family benefits. Conversely, if your organization mainly attracts a young and dynamic workforce, your HR professional may consider cutting down on benefits initiatives and increasing vacation time in order to attract the right talent. Effective compensation and benefits programs should bring the best out of your employees. As discussed earlier, keeping talent in your organization is an ongoing challenge and another way it may be addressed is through learning and development. Employees appreciate employers who are willing to invest in their people. HR Professionals analyze the needs and gaps in the talent within the organization and work to provide opportunities for learning and growth. This encourages top talent to remain within the organization and cultivates a positive workplace culture. A good company culture works to attract talent, reduce turnover, keep up morale, and motivate and engage employees. Human Resources plays a very important role in ensuring there are solid working relationships between the employer and employees. HR professionals ensure there is an effective employee relations program in place that provides fair and consistent treatment of all employees and make sure employees are engaged in their jobs. They are responsible for tracking, managing and resolving any employee conflicts that may arise. It is important for employees to understand they have the support and a resource that they can use when dealing with difficulties at work. Establishing these processes allows for grievances to be voiced within an organization prior to utilizing outside sources such as the Ministry of Labour. HR professionals work with management to identify strengths and areas of development for employees. They help the management team to develop performance reviews that are based on the organizations goals and values. Should there be any challenges in performance; the HR professional will work on courses of action such as individual development plans. Recruitment, as any business owner will agree, is difficult, time-consuming and often expensive. Talent selection and acquisition is a complicated and complex process that HR professionals can do effectively. HR professionals ensure that the talent being hired has the knowledge, skills, motivation and cultural fit with the organization. Efficient navigation of this process and solid knowledge of recruitment is essential for an effective search for talent. Human Resource is involved with every aspect of an employee’s life cycle. The success of your organization heavily relies on HR’s ability to attain, manage and grow your team towards the company’s strategic objectives. 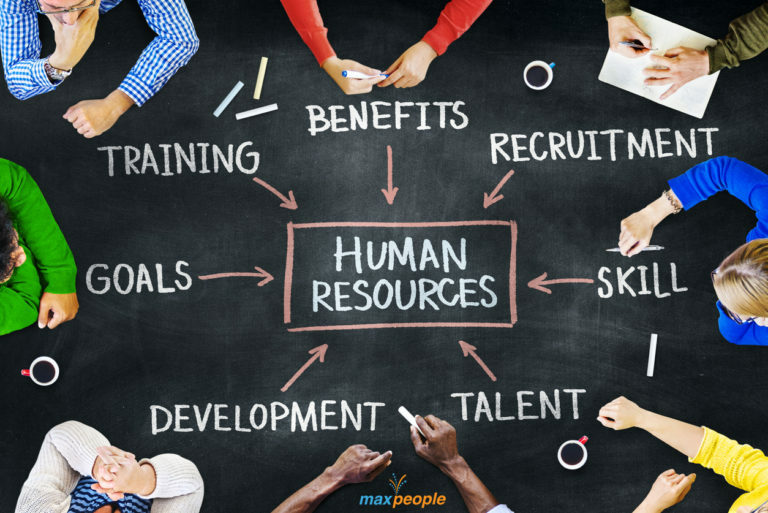 Reach out to MaxPeople if you need assistance with Human Resource management in your organization.